I wrote this to read at Mom's memorial service. I wanted to say something but knew I needed to write it ahead of time and practice reading it till I could get through it all without breaking down. My mom was the mom who made birthday cupcakes in little ice cream cones, frosted them to look like ice cream, and brought them to school on my birthday, which was a huge hit in first grade. In second grade, just before my birthday, kids asked me if Mom was bringing “those amazing ice cream cones again” and I felt like a really cool, popular kid for the first time in my life. She had the ability to make people feel special and cared for. She was a genuinely kind woman with a ready smile and quick wit, a true lady who showed grace and hospitality to everyone I brought home, even though some were less-than-favorable companions. Mom was a puzzle master; she could solve any crossword, logic problem, or anagram out there. Back in the 80’s when personalized license plates were so popular, Mom was the one who could figure out the intent behind the seemingly random assortment of seven letters and numbers. If I was out with friends and we saw one we couldn’t understand, we would write it down to ask Mom, and she always got it. My mother had a deep connection with God. She prayed fervently throughout her life, and that connection was one of the last parts of her that remained. Even when she didn’t know my name or that I was her daughter, she knew how and when to pray. Just this last summer we were at their house and one of the kids got dirt in his eyes from climbing the tree. As we were trying to clean it out and the child was crying, Mom leaned over the table to reach her hand towards him, and she was praying passionately. Her connection with God stayed with her even when everything else disappeared. Towards the end, as the Alzheimer’s stole her language skills and she lost her ability to form thoughts into words, she would lean in close to your face and snort. This baffled us at first; my mother was always graceful and polite and would never have tolerated such crass behavior from her children! But we soon realized that a snort meant she was happy. A snort and a smile meant she loved you. Her eyes would light up and she would snort, and that was her way of showing love when she didn’t have any other way to communicate. I hope to always remember the twinkle she had in her eye when she would lean in and snort. 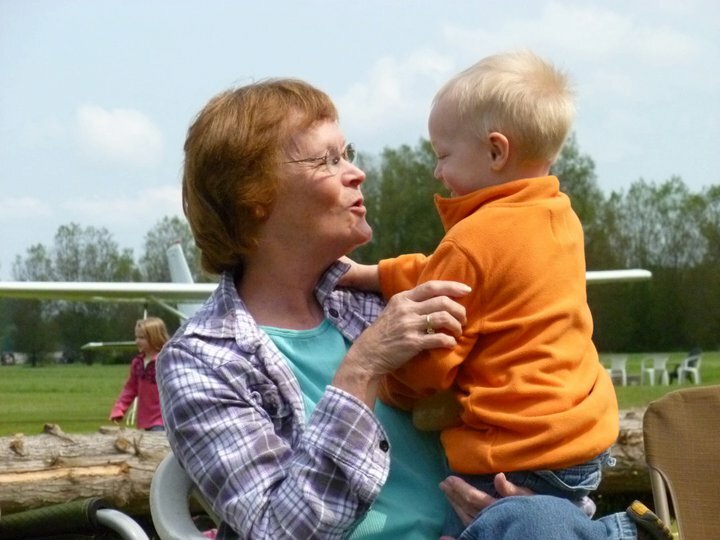 Mom’s passing has been devastatingly difficult, but it has also been a blessing in many ways. As Alzheimer’s stole her personality and her intellect, we would mourn the parts of her that were gone. Throughout her journey, we focused on, and grieved, all she had lost. Now that she is gone, our hearts are able to focus on how she lived. It has been such a joy to remember Mom as she was before the disease, and I am thankful for that. She was once an amazing woman, who had a quick wit and could solve puzzles faster than anyone else. She still holds the family record for skipping rocks; she once skipped a rock 11 times. She was bright, she was brilliant, she was kind, and she was funny. That part of her will live in our hearts and our memories, and hopefully will be modeled in our own lives as well. I love you, Mom. My life was more funner because you were part of it.